With Valentine’s Day 2019 fast approaching, take your gift-giving to the next level with a romantic, unique or thoughtful experience from RedBalloon. With our range of Valentine’s Day gifts, you’ll find the perfect present to celebrate all kinds of relationships. Roses are red, violets are blue, browse our range of romantic gift ideas that are sure to woo! Thursday 14th February is the day for celebrating all types of love and nothing does that better then with a gift from our range of Valentine’s day ideas. You’ll find the perfect gift no matter who the recipient whether it’s for your girlfriend, boyfriend, wife, husband or friend. Even better, why not enjoy one of our experiences for 2 from our gifts for couples range which is all about spending quality time together… it’s one of the best types of Valentine’s day gifts! The best thing about choosing a RedBalloon experience is that it is ready instantly. It doesn’t matter if you get it a month in advance or on Valentine’s Day (for those last minute shoppers out there)... our eVouchers can be printed as soon as your order it which saves you the hassle of trying to find something in the shops. If you’re still stuck for Valentine’s day ideas, don’t worry because a RedBalloon gift voucher is the perfect go to present. You’ll be the best gift-giver by letting them choose what they want to enjoy from our range of 1000+ experiences all over New Zealand. What is the best gifts for Valentine’s Day? If you’re looking to up your gift-giving game this year then you need to do more then just give flowers or chocolate. Instead we recommend gifting one of our amazing experiences as they make for the best valentine’s day gift ideas. There is plenty on offer from mud baths and sulphur spas to sunset kayaking tours, and yacht cruises to overnight getaways. Imagine the look of surprise and delight on their face as they open their gift to see you’ve given them an overnight Chalet getaway on slipper island for the two of you. There is nothing more romantic and thoughtful then a surprise trip away for Valentine’s Day! It’s a Valentine’s gift they will rave about to all their friends and you’ll remember it for years to come. At RedBalloon, we also offer a great range of experiences for 2 which are the perfect Valentine’s presents to spoil your significant other with. Not only do they get to enjoy an amazing experience but they get to do that in the company of their favourite person…you! 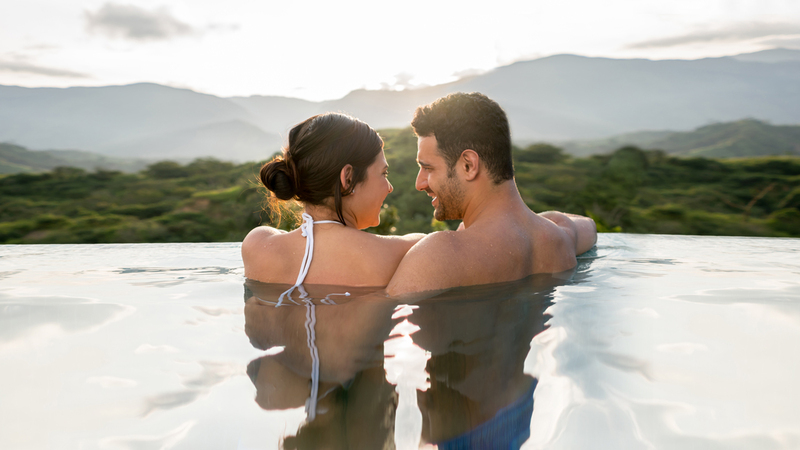 From private, indulging hot pools to blissful massages, and winery tours to seaplane flights, there is something for every couple. Valentine’s day is the perfect occasion to try something new or tick an experience off your bucket list by turning it into the perfect, romantic date. What can I do for Valentine’s Day? Make this Valentine’s Day the best yet! There is no better occasion to go all out and pull off the most romantic date for your special someone. This year, instead of just giving a Valentine’s present, why not plan out the whole day (or the weekend) with an experience. It shows you’ve put a lot of effort into making the day special and it’s the best way to demonstrate your feelings for the other person. Wake up and embark on a sensational sunrise kayak tour to Rangitoto Island or spend the day driving in style in a Porsche 911 Carrera 4S with a picnic hamper. These are just a few ideas on how you can plan the best Valentine’s Day ever for you and your lucky plus one.